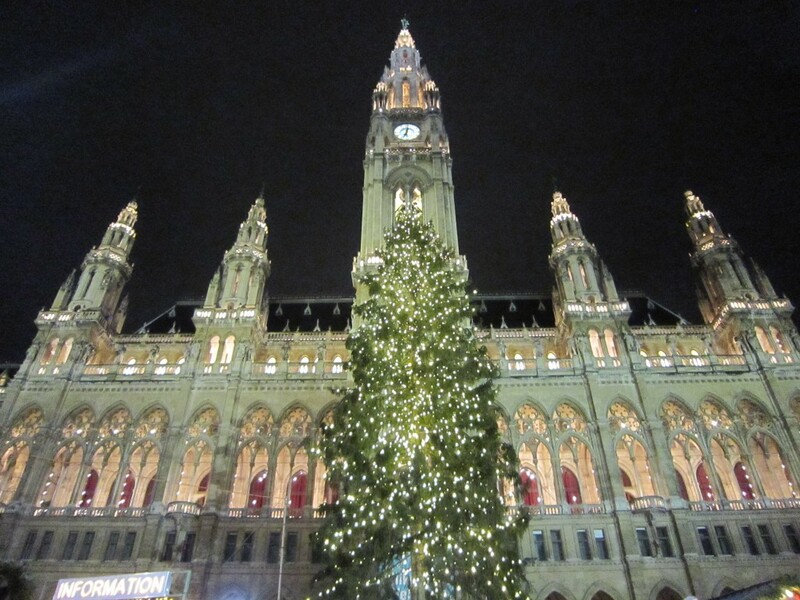 This weekend, I spent a few days in the glorious Christmasy capital of the world: Vienna. 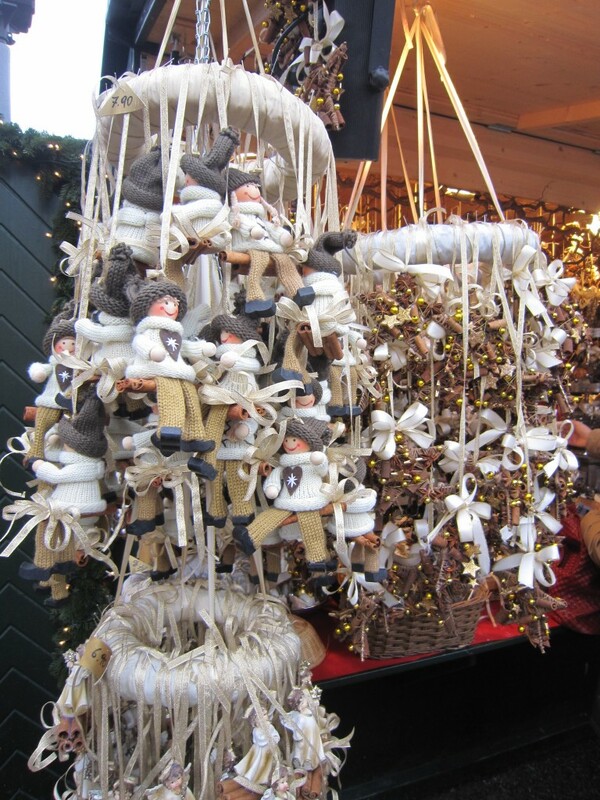 The goal for this weekend was to finish all my Christmas shopping, and to really get into the Christmas spirit. 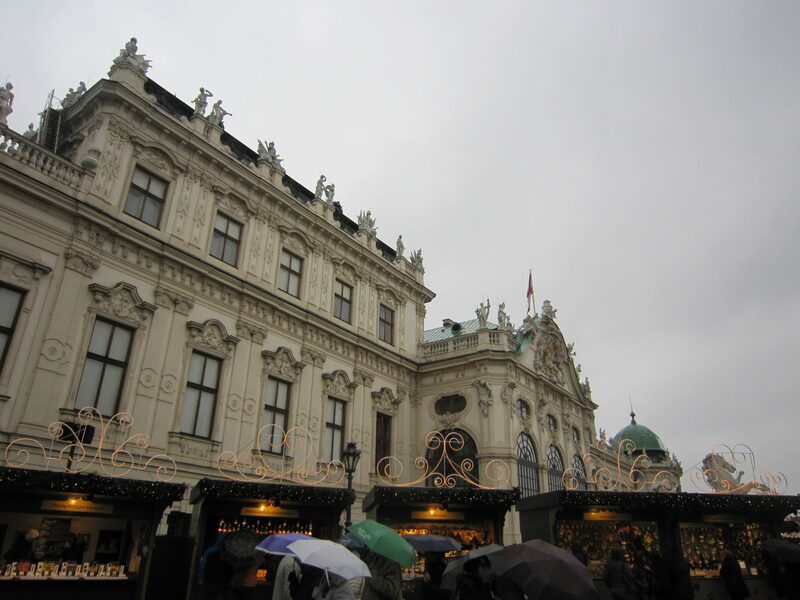 I have been feeling a little bit less-than-Christmasy this year without all my yearly traditions of sending Christmas cards, making paper snowflakes, decorating the tree, baking Christmas cookies, and singing a-million-and-one Christmas carols… So I thought Vienna would be the perfect place to really kindle the flame in my heart! 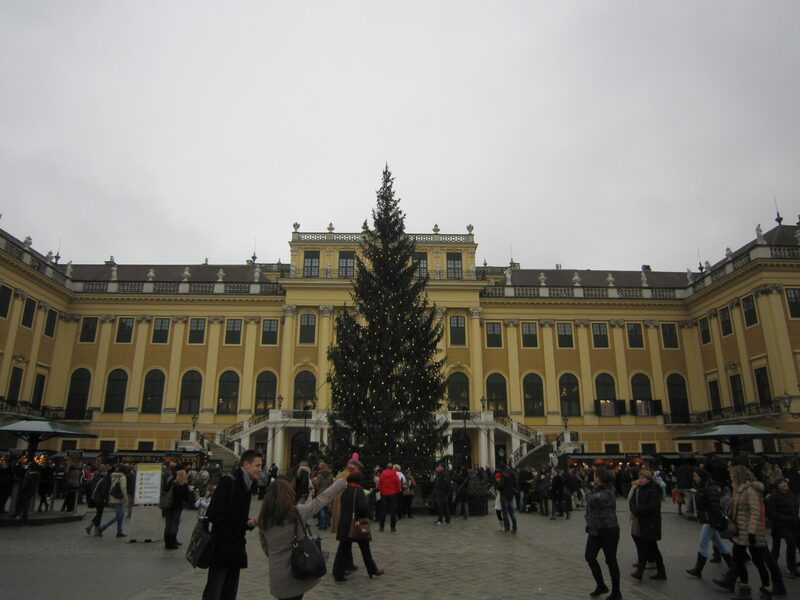 Behold my favorite Christmas Market of the weekend: Schloss Schönbrunn! 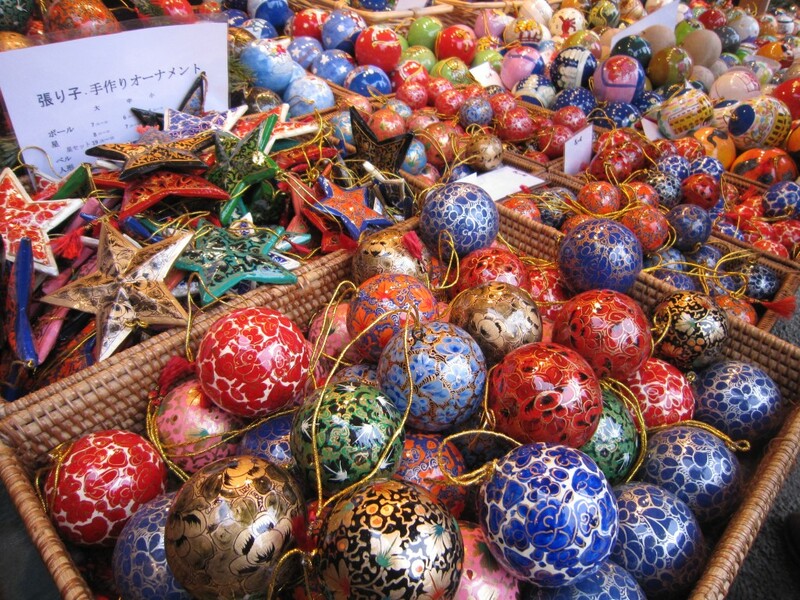 This market was nestled in front of the summer palace like a Christmas surprise, all the stands surrounding the gorgeously tall Christmas tree. 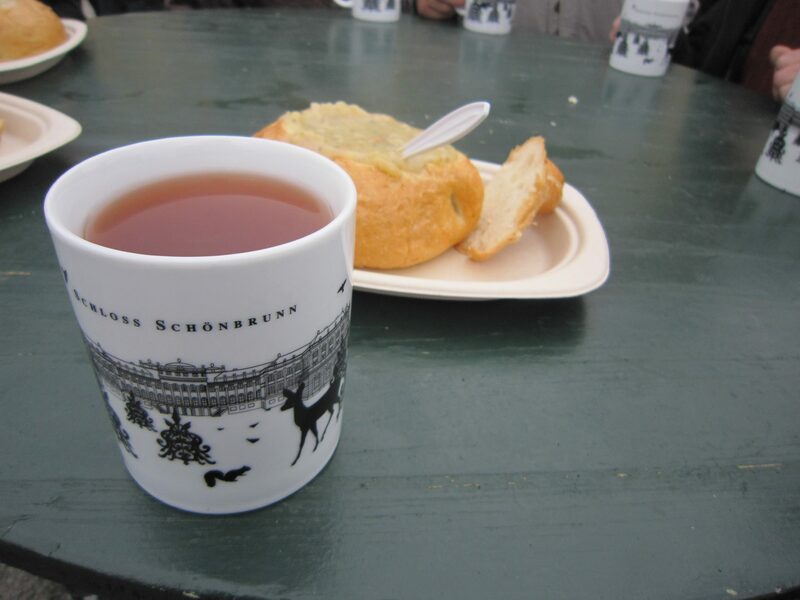 Schönbrunn also has some of the best food I saw during my entire stay in Vienna. 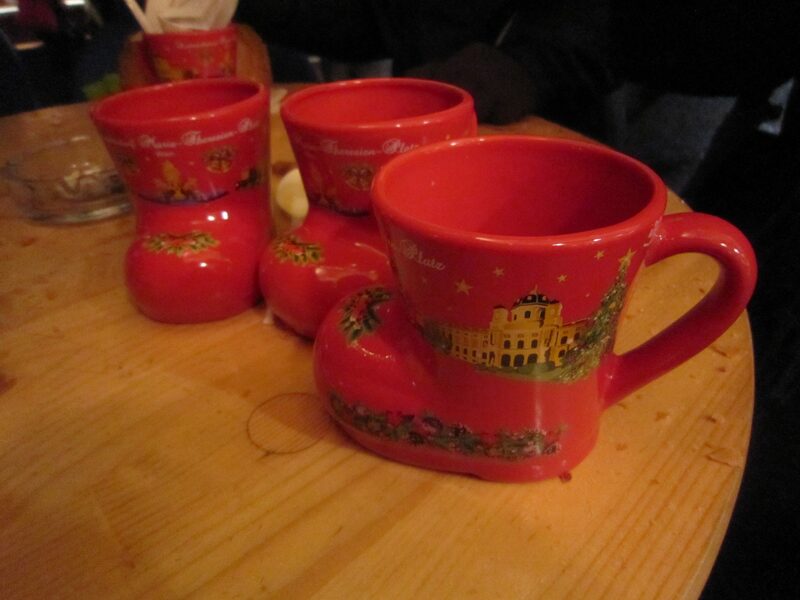 They have massive bread bowls full of steaming, thick soups, fresh roasted potato chips and fries, all kinds of punsch, a multitude of sweet nuts and pastries, a Käseknockerl stand, and so much more. 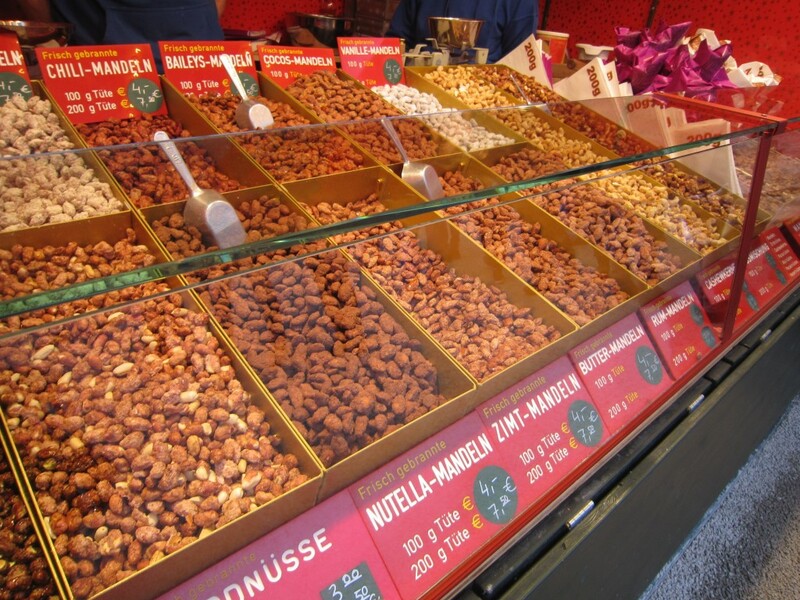 I could have eaten my entire lunch of just roasted cinnamon almonds!! 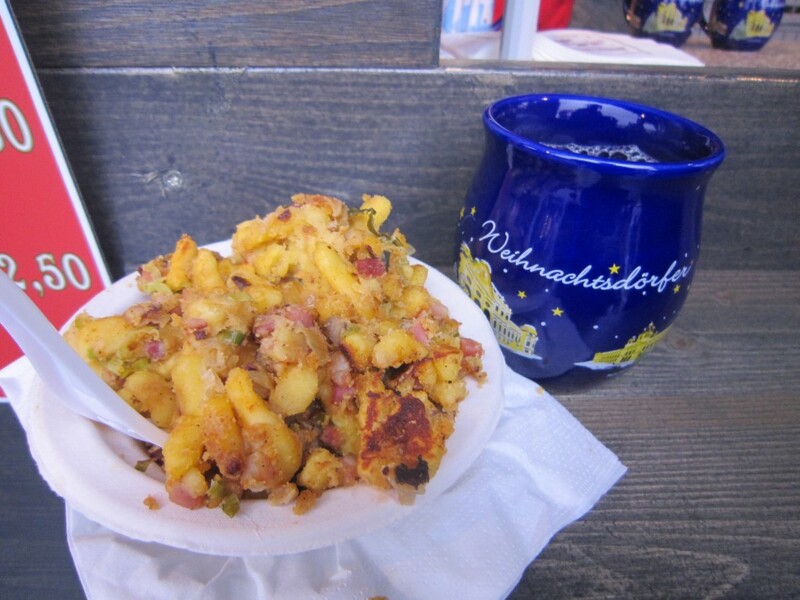 The Texas State Fair could really take note from the Austrians. 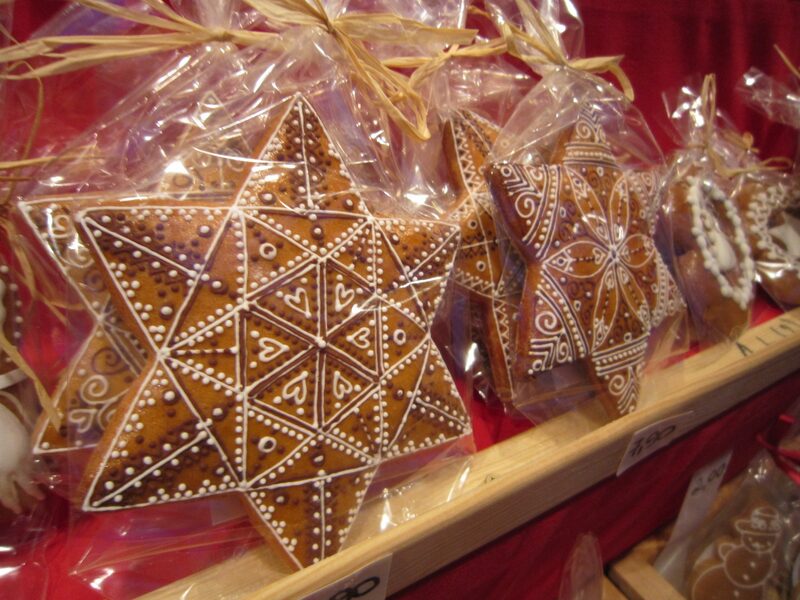 Let’s talk for a moment about what goods you can expect to find at a Christkindlmarkt. 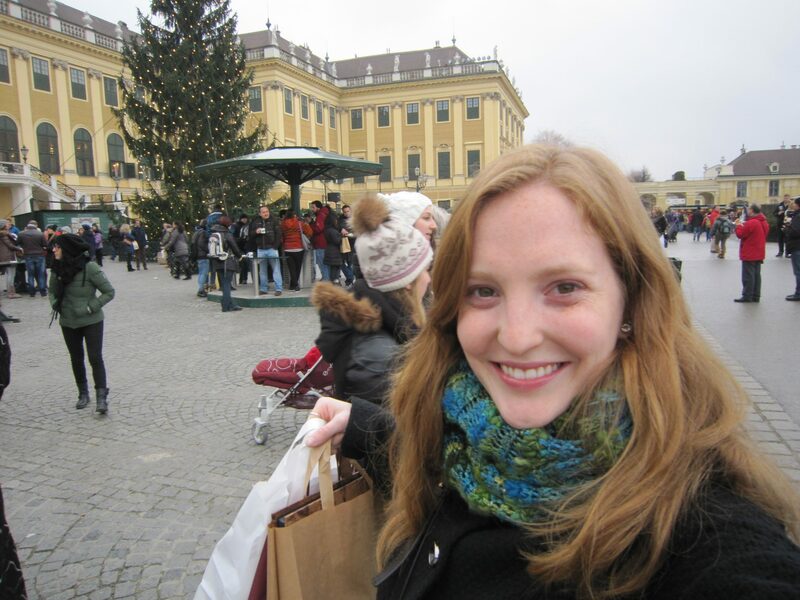 Basically, get ready to see a lot of things made from wool– felted or otherwise. 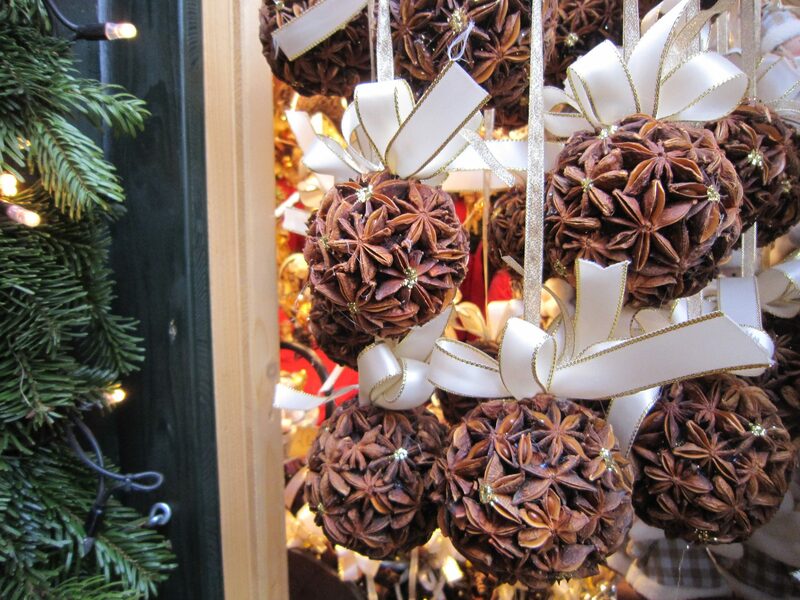 You will find yourself bombarded by stands selling winter hats, beeswax candles, dried potpourri wreaths, and wooden cut-out ornaments. Ceramic stands abound, and you will be soon tired of seeing the same old stands selling the same old colorful Christmas balls. 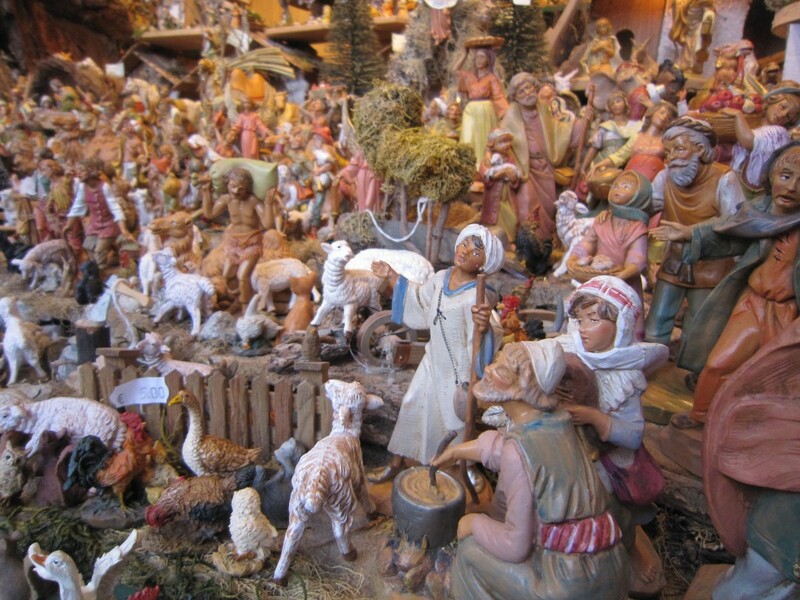 Hand-carved nativity figurines for every possible character that could ever be present at the manger, and for the first time in my recent memory, they actually do look like they belong to the correct ethnicities!! 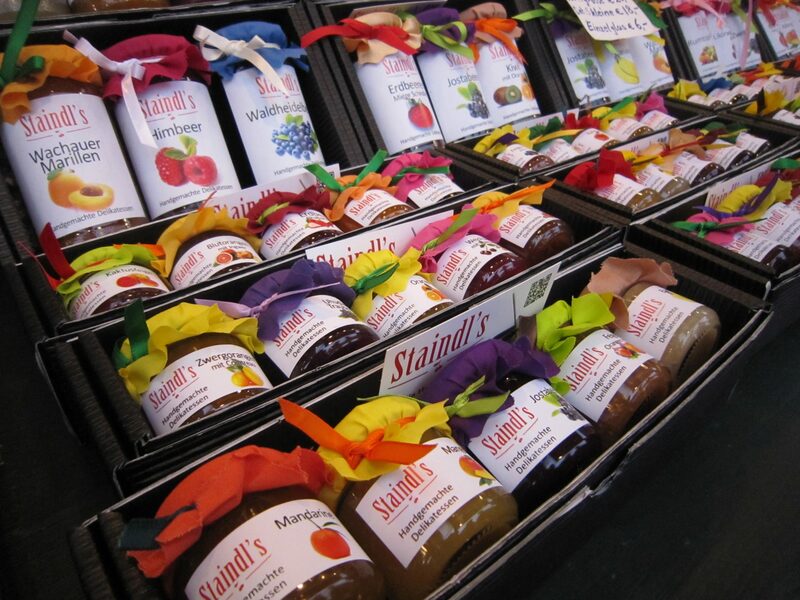 Handcrafted and colorful jellies, jams, vinegars, and oils. 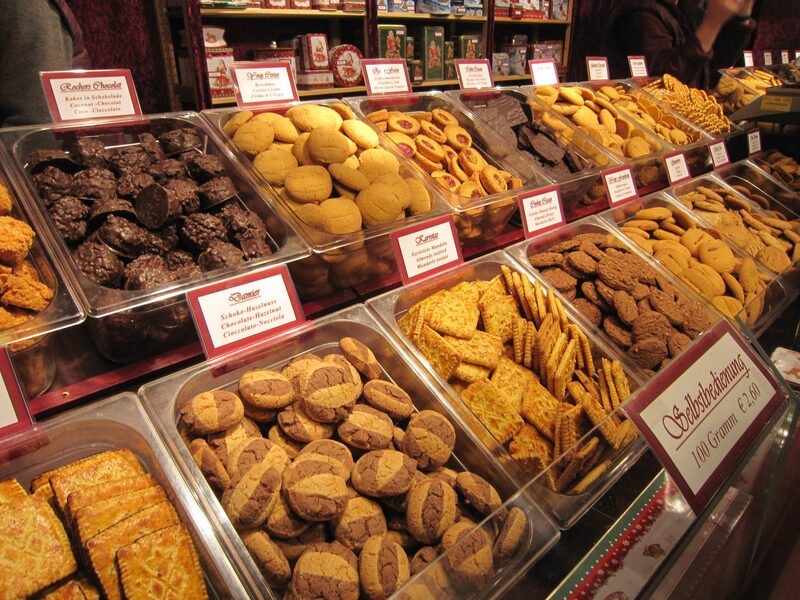 An unbelievable assortment of carefully crafted Kechse (cookies). 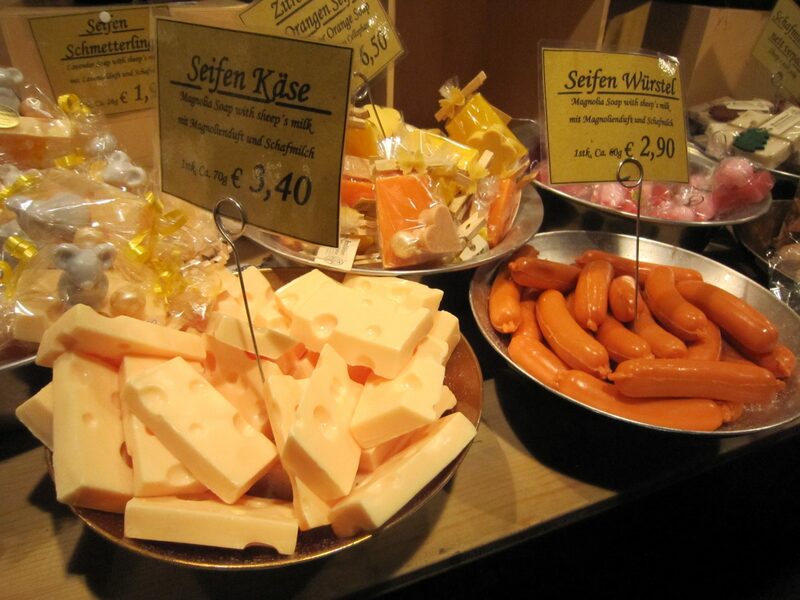 Handmade soaps which could masquerade as deli items! You could say I went a little bit crazy with the Christmas shopping. 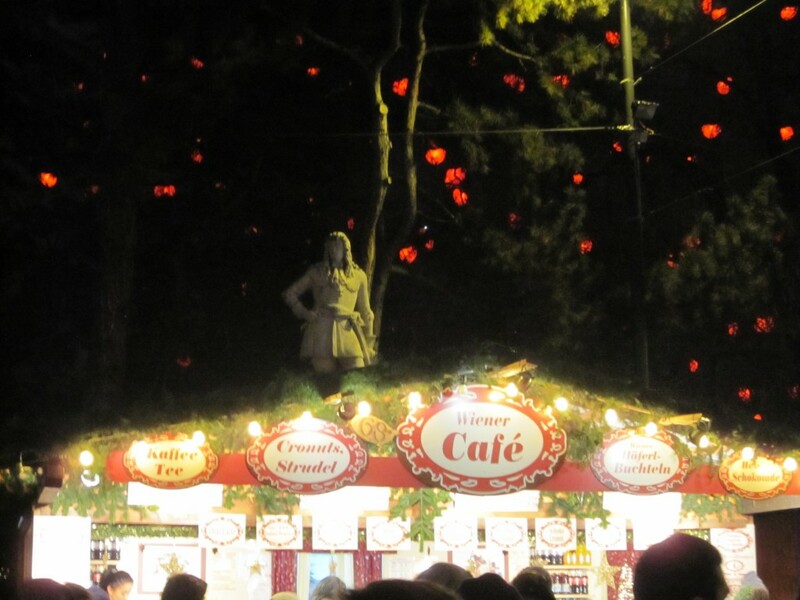 Johann Strauss presiding majestically over the punsch stand set up in front of his statue. 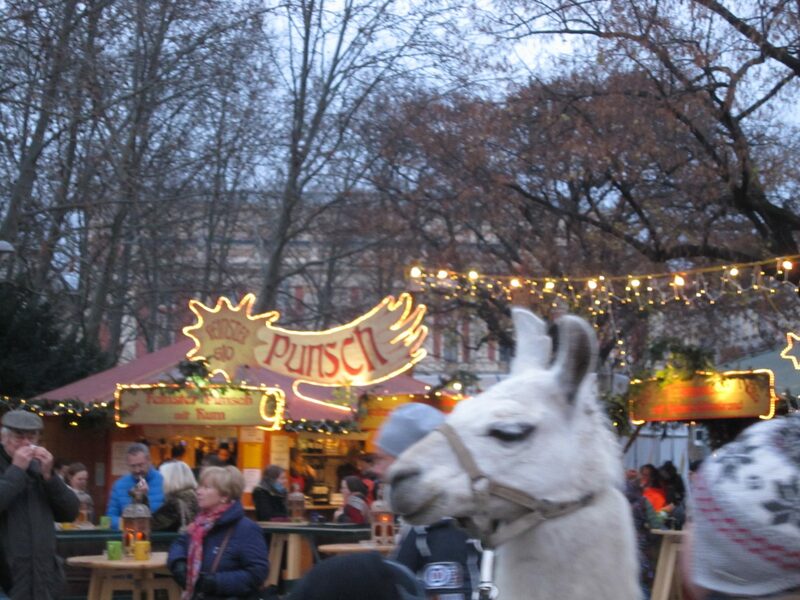 Llama rides through the market– including lots of silly expressions from our llama friend. 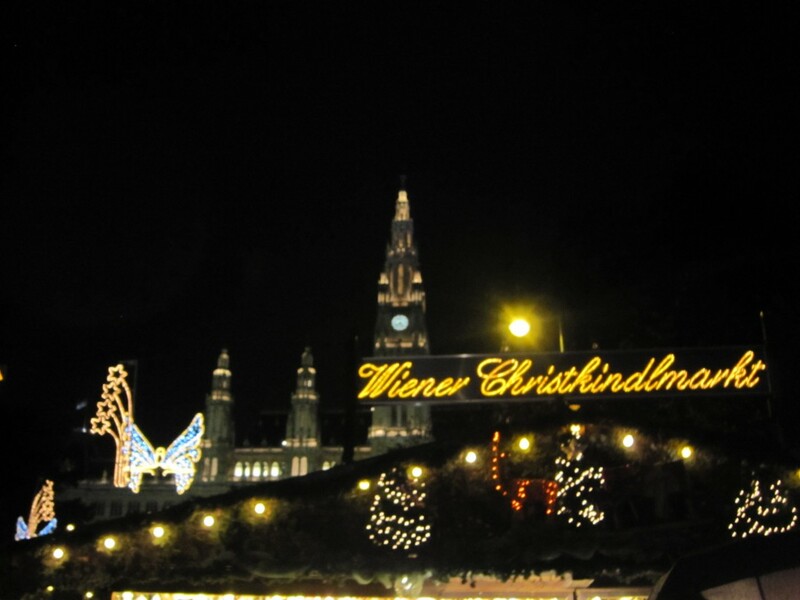 Here we see the most popular (read: touristy) Christkindlmarkt in all of greater Vienna: the markt in front of Rathaus. 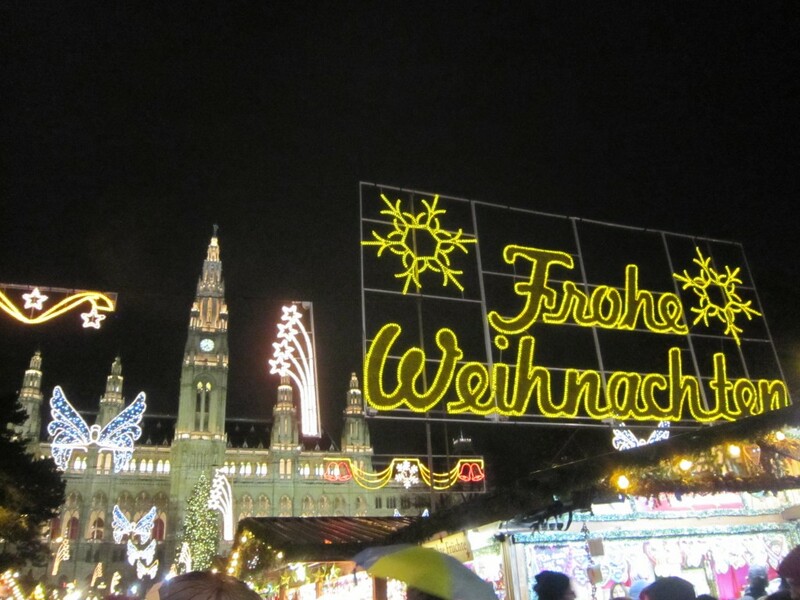 The decorations here were larger-than-life, and the views of the gorgeous Weinachtsbaum in front of the Rathaus building were worth every second of hassle. 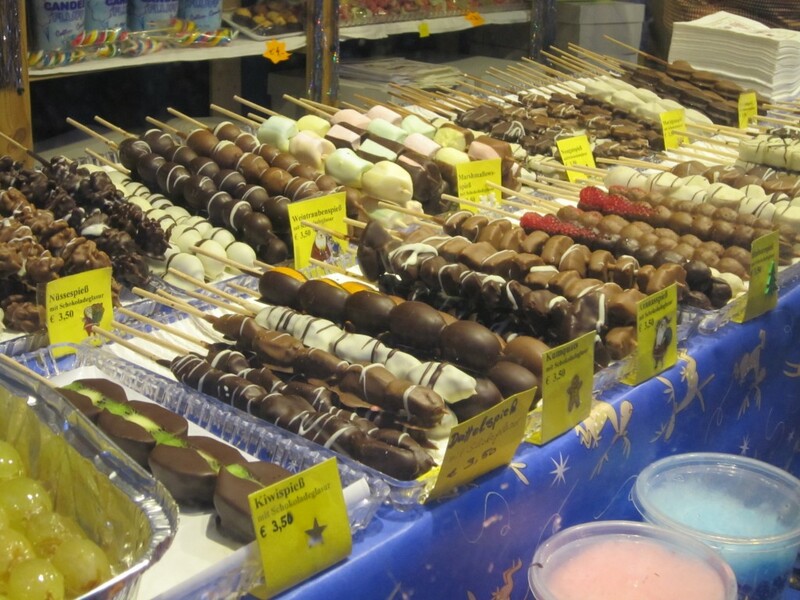 Yet, most of the time I felt like part of a herd of punch-sloshing cattle parading slowly from stand to stand. Definitely an experience I would not want to repeat any time soon! 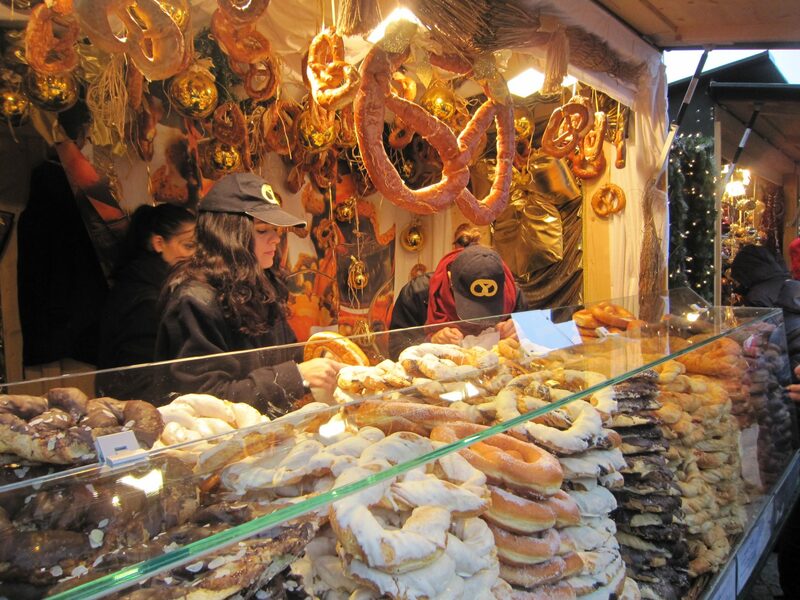 In case you haven’t quite gotten the picture yet, the Vienna Christmas Markets are just FULL of delights for all the senses! 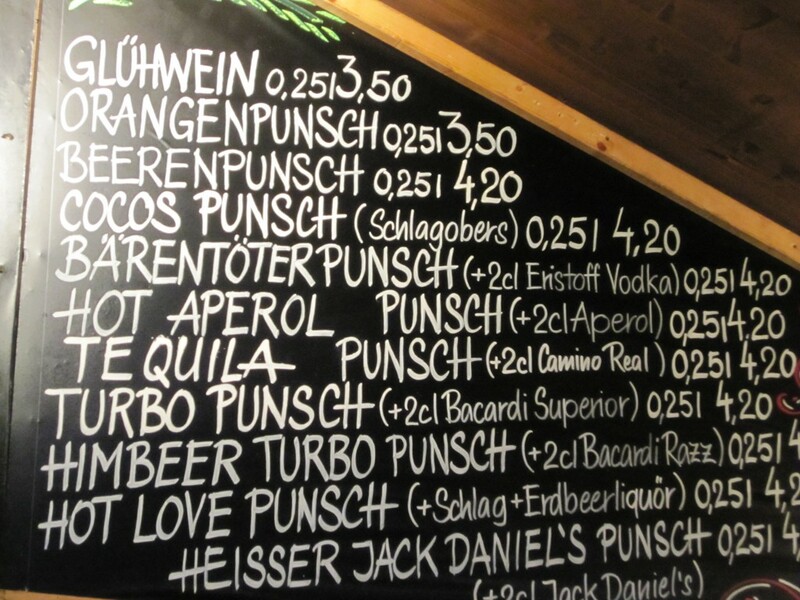 It may be cold (and rainy) outside, but if you get enough punsch and hot soup in your belly you will be just fine. 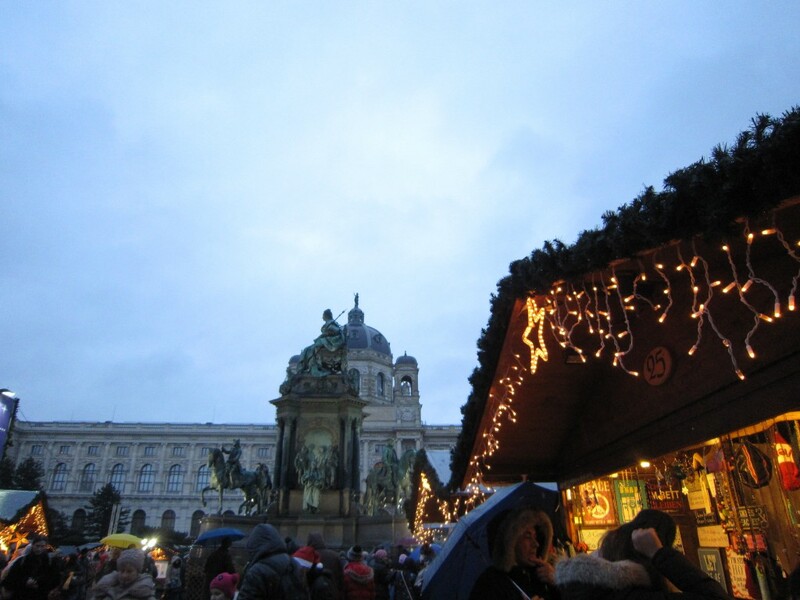 In total, I toured SIX of the nine major Christmas markets in Vienna. 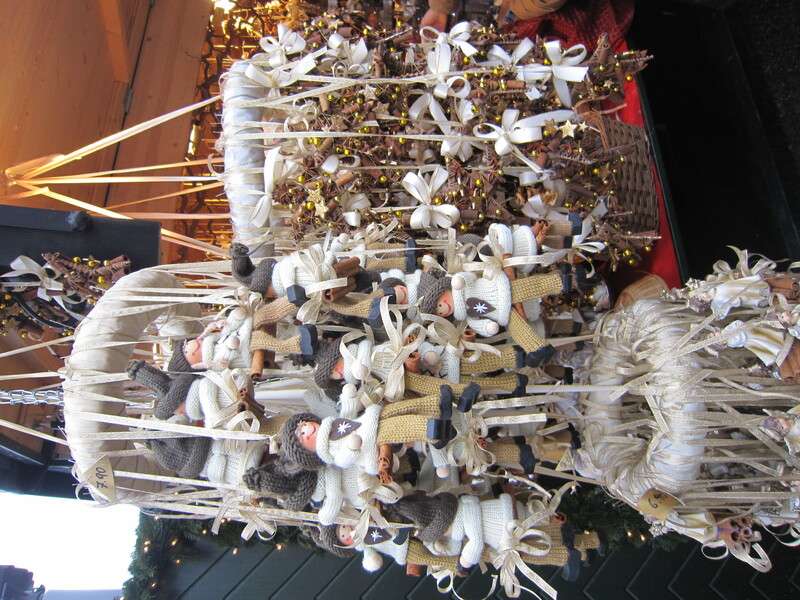 I got so much shopping done, I may need to have another suitcase in order to get it all home! 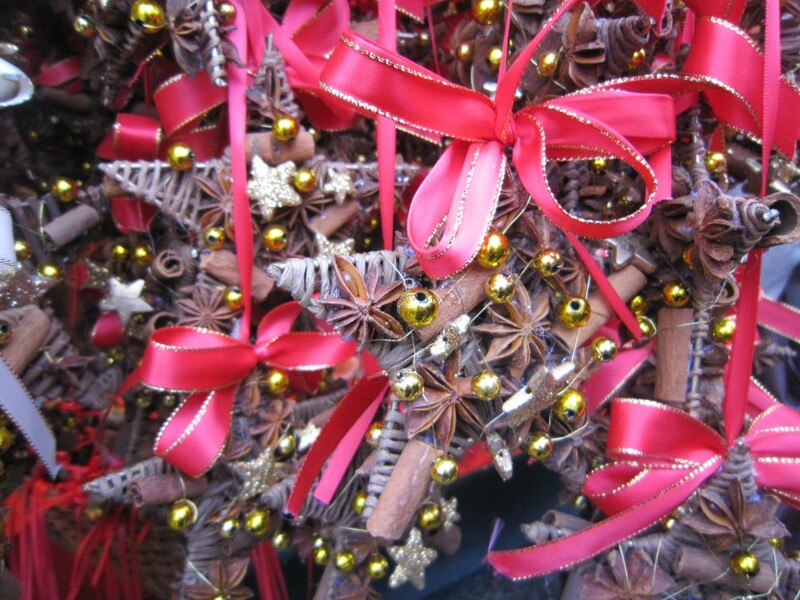 As I lugged my purchases home in ripping paper sacks that turned my hands red from the effort, I felt just like one of Santa’s elves, preparing for the big Christmas Eve night.